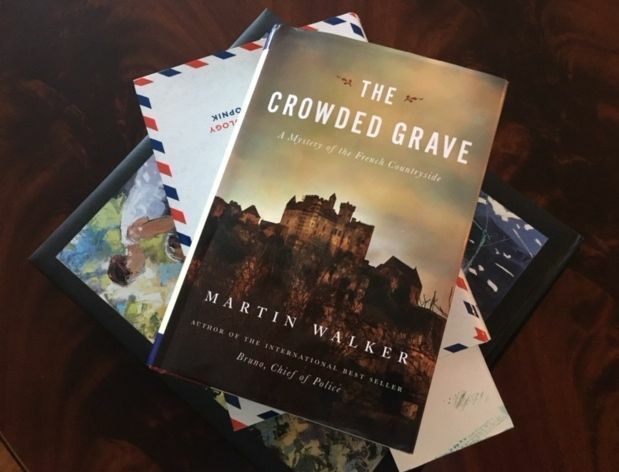 February 6, 2017 update to original post: I’m happy to report that, thanks to Martin Walker’s wonderful Bruno, Chief of Police series, specifically The Crowded Grave, I am no longer suffering reader’s block. If you love a good book set around a police officer, in which the setting is as appealing as the story, you will appreciate these well-written novels, which take place in the glorious Périgord region of France. This one has an interesting archaeological angle—part true, part fiction–entwined with Basque separatist intrigue. I haven’t been able to read a book since the week after Christmas. Two false starts and one book I was beginning to enjoy until—déjà vu all over again—I realized I’d read it four years ago. This is a curious state of affairs for a committed, perhaps even slightly obsessed, reader like me. I have been so perplexed about this that the other day, in hopes of inspiration, Miss Pup and I dusted the bookshelves, sorting out donations for the upcoming library book sale and books to be loaned or returned to friends. There are a number of unread books among the keepers, but none gave me that tingly feeling (see below). Because my friends and I are always jabbering about books, I know that such dry spells are not unusual. Part of my own problem could be that, spurred on by the Goodreads reading challenge, I barreled through one book after another in 2016, handily surpassing the goal I’d set. Reading as an athletic event. Reading overkill, perhaps? Is that even possible for someone like me? Or could it be that I’m stuck because I haven’t found the “right” book yet? After all, for me, finding that “special” book is a little like falling in love. Turning the pages gives me a rosy glow, I think about the characters even when I’m doing other things, and I’m sad, maybe even a bit grouchy, when it’s time to say goodbye. Or maybe real life just got in the way? You know, the holidays, the aftermath of the holidays, the taxes, the head cold, the Brady Bunch, the January thaw, or any of the many things within or beyond our control that we worry about every day. Could it be that the book/aka wine club selections for January and February held no interest for me at all? I mean ZIP. I will occasionally stretch to read something that doesn’t appeal, but there was no inclination to do so this time. But that could just be chicken-or-egg syndrome. I’ll catch up, hopefully, in March, as that selection, Fredrik Backman’s A Man Called Ove, is already on my shelf, and I loved, absolutely loved, as described above, My Grandmother Asked Me to Tell You She’s Sorry. But could it be—here’s the scary part—that the time I’m taking to write this blog, which is considerable, is intruding on my reading time? That I’m writing up a storm but using up the mental energy I need to read? Uh-oh. Do famous authors go through this? How do they get their writing done and still have time to read a novel? Does this happen to, say, David McCullough? How do they do it? If indeed writing is my problem, it is a significant one. You may know from my other posts that I’m a morning person. In my work life, if there were anything important to write, I had to do it by 11 AM or wait for the next day. I have only so many “good” hours of literary productivity in any 24. If I’m using those to write, then when do I read? Practicing the need for adaptability that I preach, I will clearly have to carve out another period of the day exclusively for reading. I’ll let you know how that works out. In the meantime, are you ever victimized by reader’s block? Can you suggest a remedy? Meantime, if something finally “takes,” I’ll let you know. Monica Wood’s amazing The One-in-a-Million Boy. Try it. You won’t be disappointed. Richard Russo’s Everybody’s Fool, the sequel to Nobody’s Fool. I am unabashed in my love for Richard Russo’s book. Adriana Trigiani’s All the Stars in the Heavens, a beautifully woven tale of Hollywood’s Golden Age. Elizabeth Strout’s Amy and Isabelle, a mother-daughter story I just adored. Note: If you are interested in one of these books, just click on the book title for the Amazon.com link. Photo: Miss Puppy Clouseau supervisors an “on the shelf” dusting and reorganizing mission.